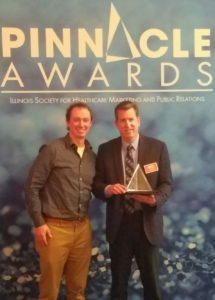 The Individual Achievement Award is presented every year at the Fall Conference to a nominated ISHMPR member who has shown outstanding work in planning, marketing, or public relations/communications in the healthcare industry. Proven innovation in public relations or marketing. Demonstrated ability to produce outstanding work. Enhancement of the healthcare marketing/public relations profession including participation in professional organizations at a leadership level, publication in professional literature or professional public speaking engagements. Willingness to share skills and help others learn and grow. Personal qualities and leadership abilities, such as integrity, the ability to work with diverse groups, a record of motivating or mentoring others and exemplifying the values and ethics of healthcare marketing/public relations to people in other disciplines and fields. Examples from inside and outside of the workplace are welcome. The deadline for submissions is October 6th, 2017. Please complete the online application and send to Devin O’Brien at devin@obriencorp.com. Self-nominations will not be accepted. The award will be presented at the 2017 Annual Conference at the Hard Rock Hotel on November 2-3, 2017. 10 or more years experience in planning, marketing, or public relations/communications, including at least five years of direct involvement in the healthcare industry. Questions? 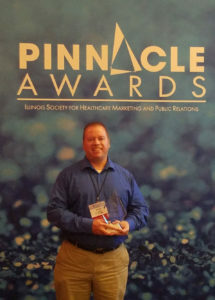 Call Randy McDaniels, President, McDaniels Healthcare Marketing (ISHMPR Immediate Past President) at 309-346-7412.